Known for highly developed language, architecture and art, and seemingly deep understanding of math and astronomy, the Mayans were an impressive ancient civilization. See how much you know about their intricate culture in the quiz below! Test your knowledge of this ancient culture. About when did the Mayan civilization begin? Most archaeologists agree that the first Mayan settlement appeared in southwest corner of the state of Chiapas in Mexico around 1800 BC. True or False: Archaeologists aren’t completely sure what led to the Mayan decline. True. Theories of their decline, which took place during the 8th and 9th century, include overpopulation, foreign invasion, revolt and the collapse of some key trade routes. How were Mayan communities organized? In a very strict system of workers and rulers. Typically, the Mayans organized themselves in small states, with one hereditary ruler, much like a king. What does the Mayan writing system consist of? Mayan writing is a combination of phonetic letters and logograms. It is the only writing system of its time and region to represent the spoken language of its people. True or False: Mayan temples are often the tombs of their rulers. False. Temples are often placed on top of pyramids, but they seem to have mainly been used to put leaders in a position to be visible from long distances. What is the Dresden Codex? The Dresden codex is a Mayan text which contains highly accurate astronomical tables. Only about 250 of 350 symbols have been decoded. 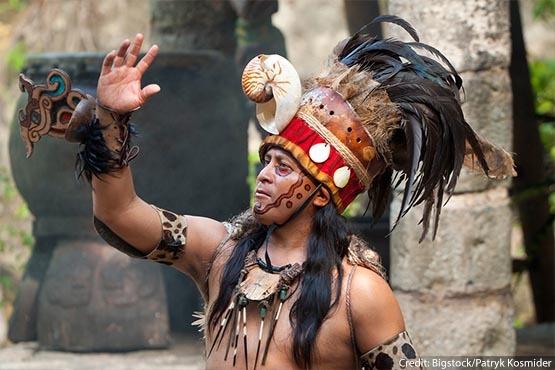 True or False: Some people still use the Mayan language. True. Some people in parts of Mexico, Guatemala and Belize are descendants of the Mayan people and speak Mayan as their primary language.